Hall, M (2019). How open tech can help explore the digital subsurface. Plenary, DigEx conference, Oslo, Norway. Presentation. Figures 8 (top) and 10 (bottom) from Hall, M (2018). Geophysical tutorial: Time-frequency decomposition. The Leading Edge 37 (6). DOI: 10.1190/tle37060468.1. Both figures relate to the time-frequency representations of musical signals. The tutorial explores lots of natural and synthetic signals. Hall, M (2018). What happened at the FORCE hackathon and What happened at the OGA hackathons. Talks at the FORCE Machine Learning and PESGB Machine Learning meetings, respectively. Hall, M (2018). Geophysical tutorial: Time-frequency decomposition. The Leading Edge 37 (6). DOI: 10.1190/tle37060468.1 (open access). Hall, M (2018). Unsolved problems in applied geoscience. Open talk at Bureau of Economic Geology, UT Austin, TX, USA. Bianco, E (2018). The exhibition booth that spoke the language of code. First Break 36 (10). Read it online. Figure 2 from Hall, M (2017). Three data analytics party tricks, illustrating how a latent semantic analysis tool works behind the scenes. Hall, M (2017). Strategies for a high-impact machine-learning ecosystem. Workshop on Data Science for Geosciences, 79th EAGE Conference & Exhibition 2017. Presentation. Hall, M, D Castañeda, E Bianco, and J Moore (2017). Random forests on the Atlantic margin: lithology prediction from wireline logs. Canada GeoConvention, Calgary, May 2017. Presentation. Hall, M, and M Niccoli (2017). Recovering data from images of seismic. Canada GeoConvention, Calgary, May 2017. Presentation. Hall, M, and B Hall (2017). Distributed collaborative prediction: results of the machine learning contest. The Leading Edge 36 (3), p 267–269. DOI: 10.1190/tle36030267.1 (open access). Hall, M (2017). Three data analytics party tricks. The Leading Edge 36 (3), p 262–266. DOI: 10.1190/tle36030262.1 (open access). Figure 1 from Hall (2016), The function of interpolation, a tutorial on interpolation methods. Hall, M (2016). Geophysical tutorial: Linear inversion. The Leading Edge 35 (12), 1085–1087. DOI: 10.1190/tle35121085.1. Hall, M and E Bianco, eds. (2016). 52 Things You Should Know About Rock Physics. Agile Libre, Nova Scotia. 130pp. Available at Amazon stores worldwide. Hall, M (2016). Strategies for transforming the open source movement in subsurface science. Workshop on Open Source Software in Applied Geosciences, 78th EAGE Conference & Exhibition 2016. Presentation slides with notes. Bianco, E (2016). Geophysical tutorial: Wavelet estimation for well ties. The Leading Edge 35 (6), p 541–543. DOI: 10.1190/tle35060541.1. Hall, M (2016). Geophysical tutorial: The function of interpolation. The Leading Edge 35 (4), p 367–369. DOI: 10.1190/tle35040367.1. Hall, M (2016). Striplog: new open source software for handling and analysing discontinuous and qualitative data. Oral paper at the Atlantic Geoscience Society Colloquium, Truro, Nova Scotia, Canada, 5–6 February 2016. Hall, M (2015). Open collaboration: hackathons and tomorrow’s subsurface software. CSEG Recorder 40 (9), Special Issue on Geocomputing, November 2015. Online version. Bianco, E, and M Hall (2015). Programming a seismic program. CSEG Recorder 40 (9), Special Issue on Geocomputing, November 2015. Online version. Hall, M (2015). Pick This! Social image interpretation. SEG Annual Meeting. New Orleans, USA, October 2015. Blog post. YouTube recording. Abstract. Hall, M (2015). Striplog: wrangling 1D subsurface data. Oral paper at SciPy 2015, Austin, USA. YouTube recording. modelr.io is a forward modeling tool. Hall, M (2014). Time freak: The fidelity of time-frequency representations. Recent advances in time–frequency transforms workshop, SEG Annual Meeting. Denver, USA, October 2014. See blog post. Hall, M (2014). The road to Modelr: Building a commercial web application on an open source foundation. Oral paper at SciPy 2014, Austin, USA. Poster version presented at Euro SciPy 2014, Cambridge, UK. YouTube recording. Hall, M (2014). SMW stories, real and imagined, from at least three geoscience wikis. Semantic MediaWiki Con, 21–23 May 2014, Montréal, Canada. Oral paper. Abstract online. Hall, M (2014). Online resources for remote sensing (Chapter 20.3). In: G Prost, Remote Sensing for Geoscientists: Image Analysis and Integration (Third Edition). 674 pp. CRC Press. ISBN 987-1-4665-6174-8. Hall, M, and E Bianco (2013). Proceedings of an unsession. CSEG Recorder, November 2013, p 36–43. Available online. Hall, M, ed. (2013). 52 Things You Should Know About Geology. Agile Libre, Nova Scotia. 130pp. ISBN 978-0987959423. Bianco, E (2012). Volume-based seismic and rock physics analysis for geothermal reservoir characterization. SEG IQ Earth Forum, Avon, Colorado, August 2012. Oral presentation. Hall, M (2012). Open mobile geocomputing. EAGE Workshop on open source geoscience software. June 2012. Oral presentation. Read about this paper on the blog. Hall, M and E Bianco, eds. (2012). 52 Things You Should Know About Geophysics. Agile Libre, Nova Scotia. 130pp. ISBN 978-0987959409. Hall, M (2012). Do you know what you think you know? CSEG Recorder 37 (2), February 2012, p 26–30. Free to read at CSEG. The 52 Things series continues to grow. All of the titles are sold at Amazon.com. 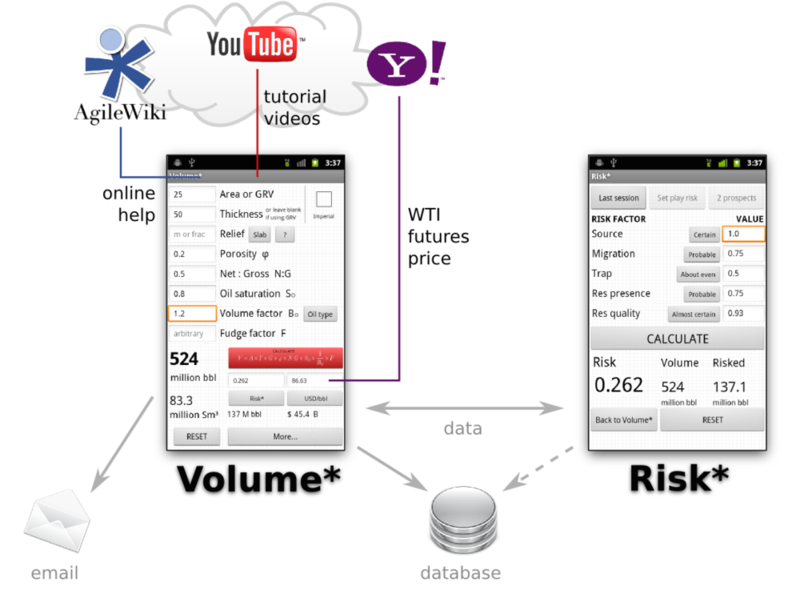 Agile's Volume* and Risk* apps. Hall, M and E Bianco (2011). Emerging potential of mobile geocomputing. First Break 29 (9), September 2011, p 51–55. Download this paper. Bianco, E (2011). Creating a software culture beyond the experts, 1st International Workshop on Rock Physics, Golden, Colorado, August 2011. Poster paper. Read about this paper on the blog. Hall, M (2011). Mobile geo-computing. Open software in computational geophysics workshop, Petroleum Technology Transfer Council meeting, Houston, Texas, June 2011. Oral paper. Read about this paper on the blog. Hall, M (2011). Recovery and growth through openness in oil and gas. Canadian Society of Petroleum Geologists Annual Convention, Calgary, Canada, May 2011. Oral paper. Read about this paper on the blog. Hall, M (2011). Our software commons and where we can make it take us. SIAM Conference on Computational and Mathematical Issues in the Geosciences. Long Beach, California, March 2011. Read about this paper on the blog. Hall, M (2010). Collaboration and trends in Geophysics. The Leading Edge 29 (11), p 1354–1361. Free to download from SEG. Bianco, E, S Kaplan, and D Schmitt (2010). Seismic rock physics of steam injection in bituminous-oil reservoirs, in S Chopra, L Lines, D Schmitt, and M Batzle, eds., Heavy oils: Reservoir characterization and production monitoring, SEG Geophysical Developments 13, 107–112. Hall, M (2010). The future is open for business: open source software for geoscientists. First Break, June 2010, p 119–123. Hall, M (2009). Lithofacies prediction from seismic, one step at a time: An example from the McMurray Formation bitumen reservoir at Surmont. Canadian Society of Exploration Geophysicists National Convention, Calgary, Canada, May 2009. Oral paper. Extended abstract. Bianco, E (2008). Seismic rock physics of steam injection. MSc thesis, University of Alberta. Trad, D, M Hall, and M Cotra (2008). Reshooting a survey by 5D interpolation. Canadian Society of Exploration Geophysicists National Convention, Calgary, Canada, May 2006. Oral paper. Extended abstract. Hall, M (2007). Cost-effective, fit-for-purpose, lease-wide 3D seismic at Surmont. Development & Production Forum of the Society of Exploration Geophysicists, Edmonton, Canada, August 2007. Oral paper. Bianco, E (2007). 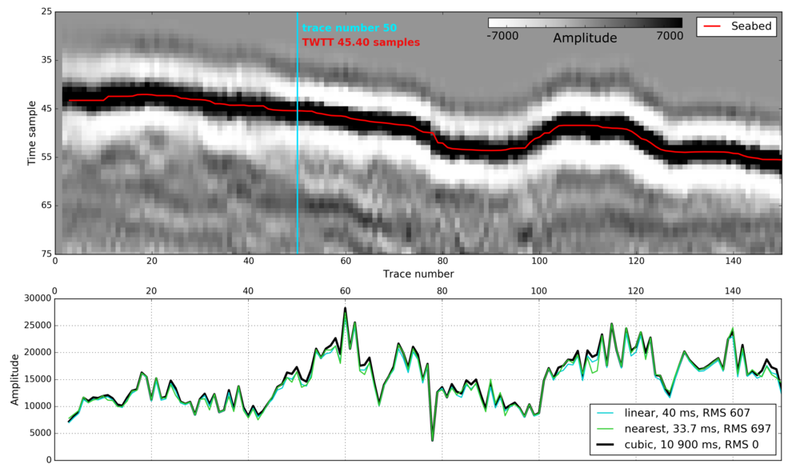 High-Resolution seismic modeling and monitoring of the SAGD process at the Athabasca tar sands: Underground test facility (UTF). SEG Development & Production Forum, Edmonton, Canada, August 2007. Download poster. Schijns, H, D Meilleux, E Bianco, L Tober, M Welz, D Schmitt (2007). High resolution VSP survey: Outokumpu borehole, Finland: Preliminary results. CSPG CSEG annual convention, Calgary, Canada, April 2007. Oral paper. Abstract. Hall, M, B Roy & P Anno (2006). Assessing the success of pre-stack inversion in a heavy oil reservoir: Lower Cretaceous McMurray Formation at Surmont. Canadian Society of Exploration Geophysicists National Convention, Calgary, Canada, May 2006. Oral paper. Short abstract. Hall, M (2005). Composite colour display of spectral gamma ray logs. Canadian Well Logging Society InSite, December 2005 [PDF]. Hall, M (2005). Googling Geomorphology. Canadian Society of Petroleum Geologists Reservoir, p 36–37. Hall, M (2005). The spectrum of the spectrum: Estimating thickness from seismic using cepstral analysis. European Association Geoscientists and Engineers annual conference, Madrid, Spain, June 2005. Poster paper. Hall, M (2005). Predicting stratigraphy with cepstral decomposition. Canadian Society of Exploration Geophysicists annual conference, Calgary, Canada, May 2005. Oral paper. Extended abstract. Hall, M (2004). Bridging the gap with visualization. Nova Scotia R&D Energy Forum, St Francis Xavier University, Antigonish, Canada, May 2004. Oral paper. Hall, M & E Trouillot (2004). Predicting stratigraphy with spectral decomposition. Canadian Society of Exploration Geophysicists annual conference, Calgary, May 2004. Oral paper. Hall, M & E Trouillot (2004). Accurate stratigraphic prediction from seismic. Canadian Society of Exploration Geophysicists Recorder, March 2004, 31–37. Hall, M (2002). Integrating well observations with 3D seismic. Canadian Society of Petroleum Geologists annual conference, Calgary, June 2002. Oral paper. Extended abstract. Hall, M (2001). Quick‐look AVO crossplotting from post‐stack seismic data. Canadian Society of Exploration Geophysicists annual conference, Calgary, April 2001. Oral paper. Gawthorpe, RL, M Hall, I Sharp & T Dreyer (2000). Tectonically enhanced forced regressions: examples from growth folds in extensional and compressional settings, the Miocene of the Suez Rift and the Eocene of the Pyrenees. In: Hunt, D & Gawthorpe, RL (eds.) Sedimentary Response to Forced Regression. Geological Society, London, Special Publications 172, 177–191. Hall, M (1997). Sequence stratigraphy and early diagenesis: the Sobrarbe Formation, Ainsa Basin, Spain. Doctoral thesis, University of Manchester, September 1997. Hall, M, RL Gawthorpe, AM Taylor & T Dreyer (1996). Tectonic tilting and its effect on facies stacking patterns and stratal surface formation: Sobrarbe Formation, Ainsa Basin, Spain. American Association of Petroleum Geologists annual conference, San Diego, May 1996. Oral paper. Hall, M (1995). Early diagenetic cements at stratal surfaces: Sobrarbe Formation, Ainsa Basin, Spain. British Sedimentological Research Group annual conference, Durham, UK, 12–16 December 1995. Oral paper. Gawthorpe, RL, L McMurray, M Hall & D Hunt (1995). Variability of forced regressive deposits in tectonically active settings. Sedimentary Responses to Forced Regression: Recognition, Interpretation and Reservoir Potential, Geological Society of London, 7–8 September 1995. Oral paper. Hall, M (1994). High resolution sequence stratigraphy and early diagenesis: the Sobrarbe Formation, Ainsa Basin, Spanish Pyrenees. British Sedimentological Research Group annual conference, Aberdeen, UK, 18–21 December 1994. Oral paper.